When Monday is coming around too quickly, the Sunday Best from Pieminister is just the comfort food you need! A good pie might just be one of my favourite comfort foods, and Sunday Lunch is a great way to round off the weekend. 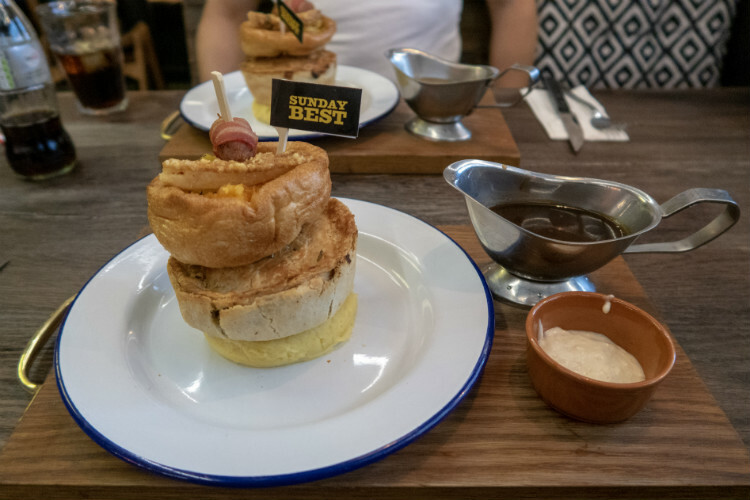 So when I heard that Pieminister were combining both of these delicious things in their Sunday Best menu, I knew that was something I had to try for myself. And when they invited me to visit their Birmingham restaurant, I was all too happy to head over there on a Sunday afternoon recently. Pieminister have been making pies in Bristol for 15 years, and now have a number of Pieminister restaurants and pie cafes across England and Wales. Their pies are also stocked in stores across the UK, and have won many awards. They’ve even supplied pies to the Queen! The Birmingham restaurant is based in the Finance district, just around the corner from St Phillip’s Cathedral. It’s about a five minute walk from New Street Station. Inside, the restaurant has a modern industrial decor with metal, brickwork and unfinished wood. But light streaming through the large windows and indoor planting mean that it feels quite airy and welcoming. The menu features Pieminister pies, of course, which include options for meat eaters, vegetarians and vegans alike. And diners on a gluten-free diet will find a small range of pies suitable for them as well. There’s even a fish pie that’s topped with a crown of cheesy mash. You can choose from small plates for sharing or as a starter. And there are some great sides available including pigs in blankets on a stick or fries loaded with toppings like pulled free-range ham, cheese sauce and crispy shallots. But we were there for the pies, specifically the Sunday Best! Sunday Best is such a genius idea, you wonder why no one has thought of it before! For £9.95, you choose your favourite from a selection of pies. These include several meaty varieties as well as some vegetarian options, and Pieminister’s vegan pie – Kevin. I love the inventiveness of Pieminister pie names, it really goes with the fun image of the company. Mark chose the Freeranger, which is a chicken and ham pie, while I opted for Kate and Sidney. I do love a good steak and kidney pie! Mark was driving, so he stuck to the soft drink options, while I ordered a glass of Freedom Four. Pieminister have a small selection of beers available on draught or in bottles, plus they have wines, spirits and even a few cocktails. Pieminister even have their own Pale Ale, which I’d definitely try out on a future visit. Before too long, our Sunday Best arrived, and they were every bit as good as I’d hoped. Your pie arrives sitting on a bed of mash, which is rich and creamy without being too whipped. It tastes like a proper home made mash. On top of the pie there’s a Yorkshire pud, filled with carrot and swede mash and baby roasties. On top of that, you’ll find a pig-in-blanket and a piece of crunch pork crackling. The pie is served with a jug of gravy (beef for me, Mark’s was chicken) and mine had a pot of horseradish sauce alongside. You can pay to upgrade to unlimited gravy, but I found that there was enough supplied for me. I love the concept of presenting all of your Sunday lunch in a tower. And from what I saw, it’s proving popular with the diners in the Birmingham restaurant. We tucked into our pies with gusto, pouring over the hot gravy and digging in through the pastry. Each pie was full of big chunks of meat and rich sauce, and the flavour was great. I deconstructed mine, moving the Yorkshire pud to the side of my plate, while Mark tackled his lunch from the top, cutting through the layers. The portion size is immense, so I had been pre-warned by a friend to go hungry. And although I thought I’d followed her advice, I still started to struggle towards the end. Eventually I decided to leave some of the Yorkshire pudding to make room for dessert. Although it fulfilled its role as a container for the rest of the Sunday lunch, it’s not the best Yorkshire pudding I’ve had. I’ve been spoiled recently with some really fantastic puds! Although the dessert menu isn’t very big, we took our time to choose, hoping to let our main course settle first. There are a couple of hot puddings on the menu, and the Sticky Toffee Pudding does look good. But Mark and I both decided to try one of Pieminister’s ice cream sundaes. There are some really interesting options to choose from, including one which is topped with bacon, maple syrup and a pork scratching! But I picked the Mud Pie sundae, which was rich and chocolatey with big chunks of chocolate brownie and salted caramel sauce. But yet again, Mark made the better decision, leaving me wishing I’d gone for his choice. His Apple Pie sunday had creamy vanilla icecream, tangy apple, and salted caramel sauce drizzled over. The combination wasn’t as sweet as I thought it might be, and was a great way to finish the meal. Our meal was complimentary, but the bill would normally have come to around £44. That’s for two Sunday Bests, two ice cream sundaes and two drinks each. If you are looking for a big hearty meal to round off the weekend, then Pieminister’ Sunday Best is just what you need. It’s great value, carb-heavy, full of flavour and very very filling. I’ll definitely be going back, and I just know that my teenage sons are going to love it. This isn’t a delicate, fine dining experience, that’s for sure. But sometimes what you need is a plate full of delicious comfort food to make you forget that Monday is coming up just around the corner. Thanks to Pieminister for an excellent Sunday Lunch! Wow look at that amazing Sunday lunch stack! I love the Pieminister Sunday Best, I had it a few weeks ago and it was delicious. Now this sounds like a delicious place to go and get something to eat. I have to admit I always forget that Birmingham has so many different restaurants on offer. Pieminister – sounds like somewhere I need to try. I’ve never been to Pieminister. OMG the way the food is stacked! So crazy and awesome. And those desserts look great. Shame the Yorkshire pudding wasn’t up to scratch. I love PieMinister Pies. I haven’t visited their restaurant but now I really want to. I love the idea of the ice cream with pork scratchings! Anything salty and sweet does it for me. oh i love a good pie – im a home comfort food girl at heart so this appeals to me more than fine dining! The Sunday’s best looks so delicious! My mouth is just watering right now for some pie. How delicious do all of these dishes look! Yum! Ooh, the food here looks absolutely divine. I’d definitely give their Sunday Best a try! I hadn’t heard of Pieminister but it looks amazing! Especially that Sunday lunch one!